The above image of M51 Whirlpool Galaxy is by NASA and European Space Agency and is in the public domain. The Wosite chart in this article is by S. Sakata. This article describes Wosite cosmogenesis, how Cosmos and Earth are created by primordial forces of Universe. While we show only one short passage, the insights expressed here have been derived from other passages in Wosite literature. It is quite difficult to render into contemporary English. It requires study and practice of esoteric and hidden teachings. It is our intention to offer our modest knowledge so that people everywhere may benefit from it. There is a very profound description of the origination of Cosmos, Sun, Moon, and Earth, found in Hotuma Tutae lines 2576-2583. This passage in Wosite is reproduced above, as verse in rhythms of five and seven. Next, we present the voicing of the verse. As you read it out loud, please sound each syllable clearly and consciously. ame, cosmos, sun. tuti, earth. hirakeru, opening, separating in a natural way. toki, time. hi, first (when written as shown). iki, breath, will, mind. wakarete, divide. wo, male aspect of energy. me, female aspect of energy. naru, to become. utuho, ‘space’ energy of universe. kase, repetetive motion. umi, born. ho, fire (when written as shown). u, great. wose, male energy. mune, breath, origin, root. hi-no-wa, sun (when written as shown). i, will, mind, intent. minamoto, essence. tuki, moon. hani, soil without water; stabilized, fixed, determinate. mitu, energy moving, flowing. katu, moreover. yama, mountain. sato, plain. first breath divides into a pair of Me and Wo. and Kase separates out Ho. The essence of I-me becomes Tuki. Tuti is made of Hani and Mitu. And Hani makes mountains and plains. With the first breath of origin, various phenomena occur. First Utuho Space energy divides into a pair of Male and Female energies. The Male energy being lighter, it becomes Sun and other celestial bodies. This is called Ame. Female heavy energy firmly solidifies and becomes Earth and Moon. Kase comes from Male cosmic energy. Kase Wind energy is a regular occurrence, repetitive motion. It means that something is happening, regularly repeating. Although Kase is unseen, it implies the passage of time, and even more importantly, that time itself exists. The part of Kase that moves vigorously at high temperature is called Ho, Fire energy. These three —Utuho, Kase, Ho — are always moving strongly, and are Male cosmic energy. Sun from the Male was placed near Earth. Moon from the Female was placed closer to Earth. Life forms of people are comprised of inter-workings and characteristics of the five: Utuho/Space, Kase/Wind, Ho/Fire, Mitu/Water, Hani/Soil. Male energy of humans has Sun as its essence; Female will of humans has Moon as its essence. The ground of Earth can be divided into Mitu and Hani. The hardened stable Hani makes the soil of mountains and fields. Water is a form of Mitu. The nature of Mitu is to increase as it flows, gathering while not changing its essence, and flows without stopping. It is important to note that Space, Wind, Fire, Water, Soil, are not “things”; they are primordial energies with characteristic types of activity and therefore they represent processes. We may think in terms of gerunds: Soil hardening, Water flowing, Fire heating, Wind blowing, Space activating. Although this is rather simplistic, it is a start toward deeper understanding. We suggest that you spend time sounding the vowels to feel their primal energies. Write Wosite vowels and imagine their deep meanings. It seems to us best to use the original Wosite terms for the five energies, since they are so rich in meaning. This Wosite verse describes the separation of Uchuu into Ame and Tuti, Universe into Cosmos and Earth. It explains how Earth and Moon are created differently from the rest of the Cosmos. Uchuu may be said to be Universe, if we agree that Universe is All That Is. The essence of Universe is energy. Primordial energies are the source of our Cosmos. These energies are Utuho, Kase, Ho, Mitu, and Hani. Because the original energy divided into Male and Female aspects, the five primordial energies also bear these aspects. Utuho, Kase, Ho are Male energies. Mitu and Hani are Female. To most astronomers, cosmos and universe are practically synonymous. However to esoteric thinkers, they may not be exactly the same. We may say that astronomers study the cosmos, the observable universe. The word “cosmos” originally meant to ancient Greeks the orderly universe. We may think of planets, sun, stars, galaxies as being observable and orderly. In recent times, the presence of dark matter and dark energy has been discerned. Thus, the study of the cosmos by astronomers now includes invisible yet observable (through their effects) matter and energy. Let us agree to use the term “cosmos” to mean this kind of universe. Ame is Cosmos, the universe of outer space: sun, stars, galaxies, … Ame/Cosmos is produced by primordial Male energies. Tuti/Earth, is produced by primordial Female energies. Ame is not identical to Uchuu. In our view, Cosmos is only a part of Universe. In summary, Uchuu/Universe includes Ame/Cosmos and Tuti/Earth, as well as the laws and principles of Uchuu/Universe and its unseen energies. Earth and moon, by NASA. This entry was posted in Cosmos, Earth and tagged Ametuti on 2016-01-02 by Okunomichi. We show here the writing of yama, mountain. This is an example of utuho-tai used to mean a location relevant to the situation. Here, in ya: a person on the mountain is looking up at the sky above the horizon (horizontal bar) for the rising movement of the sun (represented by the vertical bar). In ma, ma-sou is looking at energy coming down from above. The horizontal bar of ya means horizon; the horizontal bar of ma means the zenith of the sun. The movement of the sun is indicated by the vertical bar in both cases. The top of the mountain is a place that gets light for the longest time; it is closest to Ame. It is a place of gratitude for this gift from Ame. Perhaps this explains why Nihonjin have revered mountains from ancient times. In Wosite literature, horses are mentioned many times. They were treasured as special animals. There are two names for horses. The horse that is natural or wild is called muma. The horse that one rides is called koma. Notice the difference in the ideograms of mu and ko. The wild horse is indicated by the ideogram of ho-tai overlaid with m symbol implying a more fiery temperment. Mu means able to move freely with natural energy. The domesticated horse is stable and fixed, as the hani-tai indicates. The common syllable ma is the ‘certain place’ of utuho-tai, namely the horse’s body. Toyoke taught how to train wild horses: firmly seated on the horse’s back, slowly and gently keep the stepping in rhythm with the breath, for this is essential. Always get to know the horse’s mind. Wild horses don’t know but to run freely, and can toss the rider to the ground; so if we keep training on a daily basis, the horse will become well-accustomed to being ridden. This entry was posted in Vowels and tagged Horses, Mountains on 2016-01-02 by Okunomichi. Hani-tai, as its square shape indicates, is heat energy circulating in a stable manner. It means that it is getting dry and firm. The process of change is over and has been completed, as the image suggests. Hani is dry ground, clay. This is explained by its name, ha-ni. Notice how stable the ideograms ha and ni look. Hani receiving rain from utuho makes grass and trees utuho helps water cools. Ground receives rain water from utuho (light, in this case air). Grass and trees grow with the help of utuho and cooling water. Observe the second time, utuho is written with the ho allograph, implying heat of fire. This may refer to radiational/radiative cooling. These lines again allude to the cycle of water. In any case, hani-tai is the solidification and completion of process, the building of land and mountains. This entry was posted in Vowels and tagged Hani on 2016-01-02 by Okunomichi. Mitu-tai is shown here. It is the basic shape for the vowel sound e. Mitu makes us think of mizu, water. Yet it means much more. The mitu-tai is clearly a process of flowing motion from top to bottom. The top of the shape is energy which is light, like vapor, mist, dew, or cloud. The vapor gradually becomes drops of water which come down, water flows on the ground and is sucked into the earth. As it moves, water gathers more and more quantity, from high to low places, and finally flows into the sea. The next figure shows how the word mi-tu is spelled out in Wosite. It is made up of the m consonant with kase-tai vowel i plus the t consonant with ho-tai vowel u. This is clearly a description of the water cycle where water comes down as dew and rain into rivers which then evaporate to form clouds and the cycle repeats. This entry was posted in Vowels and tagged Mitu on 2016-01-02 by Okunomichi. Motoake (Moto-ake; moto, origin; ake, opening) literally means “opening of origin”, i.e., creation of Universe. Amoto (A-moto; A, cosmos, Universe; moto, origin) is a synonym, and it means creation of Universe. The profound and beautiful Motoake chart was designed by Toyoke-sama to teach how the universe is created by the Original Presence, Amemiwoya. The charts were especially created by S. Sakata for this site. We colored the central circle pink to show it clearly. In the circle are three symbols. 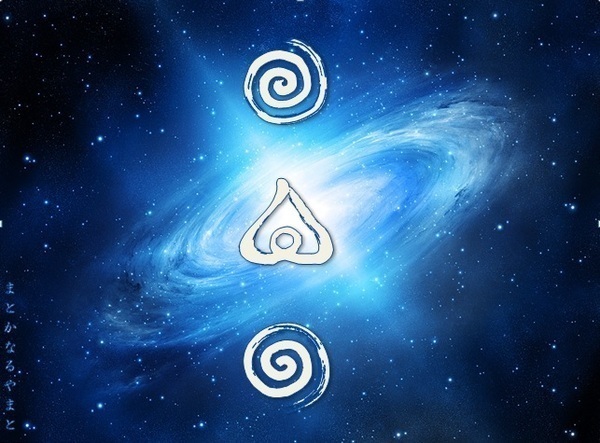 The upper spiral which opens counter-clockwise is the A symbol of Ame, Cosmos. The other spiral which opens clock-wise is the Wa symbol of Wa, Earth. In the very center, the ho-tai U symbolizes the movement of creation caused by Amemiwoya. This is most important. The central circle represents the place of Amemiwoya. Creation was brought about by movement. This is the beginning and the origin of Universe. It divided into Earth and Cosmos, the rest of Universe. The Wosite letters A, U, Wa describe this process. They are in the center of the figure, and they represent the Center of Universe and Amemiwoya. 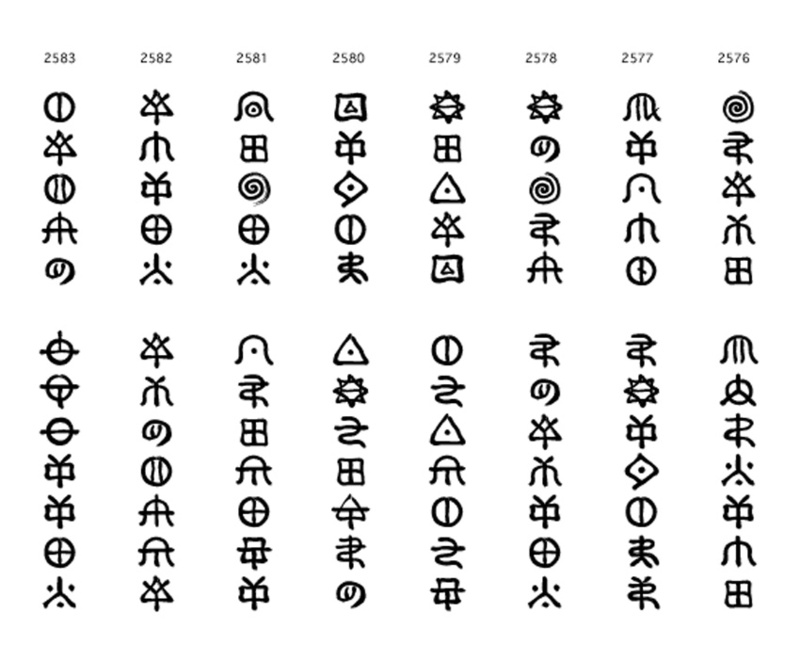 Here is an enlargement of the three central ideograms. Enshrined in the central circle with Amemiwoya is Minakanushi, first of mankind on earth, and first of the top leaders of Japan, the Kunitokotachi. This place is called Amoto. It is symbolized by the North Star. The eight ideograms in the innermost ring are the names of the eight Akuta-kami: To, Ho Ka, Mi, Ye, Hi, Ta, Me. These eight govern the corresponding eight phonemes. The Akuta have special important functions having to do with space and time. Next, we turn our attention to the second Motoake chart with two colors. There are eight kami in the second ring; they are called Anami-kami. (The ring is colored pink.) Anami-kami are in charge of the phonemes A, I, Hu, He, Mo, Wo, Su, Si (the phonemes in the pink ring). Anami-kami are Kami that bring down cosmic vibrations to form the human body. They control the mime-katati. How is this done? In response to the phonemes, thirty-two Misohu-kami produce human mime-katachi (human appearance and constitution of the body). Misohu-kami are thirty-two reverberations of voice. They are shown colored yellow in the outer two rings of the chart. Because there are eight kami in each of the first two rings and sixteen in each of the next two rings, there are a total of forty-eight kami represented by the forty-eight ideograms for the phonemes of Wosite. The Motoake chart shown above symbolizes the manifestation process. It was designed by the sage Toyoke-sama to help people understand the process of Universe. It comes from the Hutomani document written in Wosite by Amateru Amakami. As we stated in Post #1, the original name given by its author was Moto ra tutaye no humi. This means a humi for solving a problem by applying the principles of Amenaru-miti, the Way or Law of the Cosmos, as taught by the Motoake chart. What does the word Hutomani mean? Let us break it down into its parts. Hu is the appearance of a new strong movement, an inspiration from Ame, Cosmos/Universe. To is the gathering of the inspirational movement and stabilizing and solidifying it. It also refers to the teaching of To no Wosite from ancestor To-no-Kunisatsuchi as taught by Toyoke-sama. Ma means receiving new energy, gathering the energy, and conveying it down to earth. Ni is harmonizing the energy and manifesting that energy. A new strong movement of inspiration appears from Universe. The movement is gathered, stabilized, solidified according to the teaching of To no Wosite. The new energy of movement is received, gathered, and conveyed down to earth. This energy is harmonized and manifested on earth. We will provide you, dear Reader, further explanations of Hutomani and the Motoake. This entry was posted in Cosmos, Motoake, Vowels and tagged Akuta, Amemiwoya, Amoto, Motoake on 2016-01-02 by Okunomichi. 1. Ho-tai is shown above. It is the basic shape for the vowel u. It generally represents hot and light energy. Note the sun is shining down onto the ground of earth. The ground heats up, air moves up, The diagonal lines represent the coming and going of heat, moving very strongly. Therefore, ho-tai represents dynamic, powerful movement itself. This powerful energy can create new things, new forms of things. Orion Nebula, birthplace of stars. 2. The word ho is written in the ideogram above. It is made up of two parallel lines for h plus the square of the hani vowel o. So the word ho is born. It has several different meanings. For example millet and rice put out new ears (called ho). As time moves, there are seasons and years, and new things appear. This movement causes creation. The wosite u thus means big and great. It represents the beginning and origin of the universe. The shape of hani two columns stand very closely this precious shape. Indeed, the shape of ho-tai is precious, for it represents the powerful force of creation. 3. Allograph: each of two or more alternative forms of a letter of an alphabet or other grapheme. There are various allographs of ho as shown here. They include those for ‘time of year’, ‘millet ears’, and two forms for ‘fire’. The second is rarely used. The meaning of ‘fire’ is not only the ordinary fire, but it is also the hot energy that makes new things. 4 . We show lines 11552-11553 from Mikasafumi (right) and 2638-2640 from Hotuma Tutae (left). On the first day of the Ho harvest season, autumn equinox, people make maturi for food. kami matsuru gather rice and millet ears and polish the grains white the first day make okayu and shiru. Kami refers to a powerful natural force, here the grace of autumn. Maturu means honoring and thanking kami in a festival. So-ro are rice and millet, and hotumi means the ears are gathered. Usu tuki refers to polishing grain with an usu stone mill to make it white. Hatsuhi, the first day of the maturi, it is made into porridge/gruel and soup. The Hatsu-ho Matsuri (festival of first harvest of rice) is held annually at shrines. In the shrines of Ise Jingu, they are held during the month of October. It is a time when the first harvesting of rice grown at the shrines is offered to Kami in gratitude. There is a later matsuri when the rice is cooked and presented to Kami. The photo below shows the harvest boat arriving on the grounds of Naiku Inner Shrine of Ise Jingu from the sacred Isuzugawa (Isuzu River). It is laden with sheaves of rice. The sign in Japanese reads: O-hatsu-ho. The matsuri is a joyous time for the local community as well as the shrine. This entry was posted in Kototama, Vowels and tagged Ho on 2016-01-02 by Okunomichi. 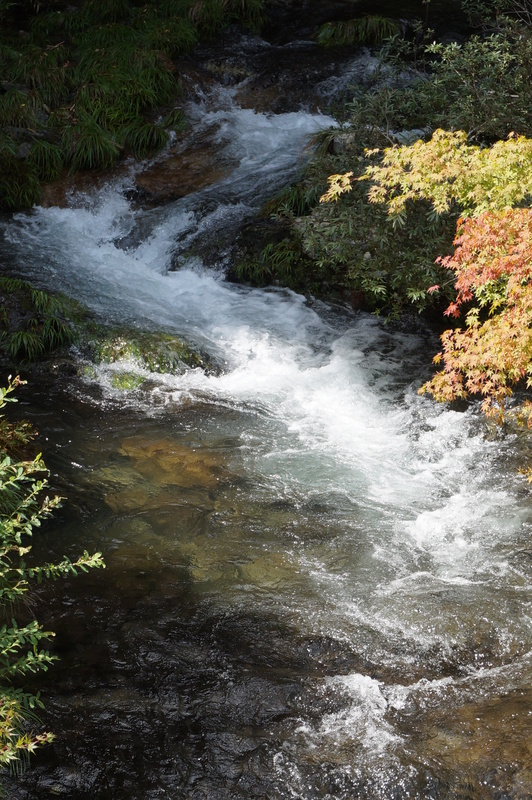 Isanami-no-Mikoto has been revered throughout the land since Wosite times. Isanami was a woman of great accomplishment in the annals of Hotuma Tutae. She is remembered in myths, legends, and in shrines even today. There is a monument for her in Izumo, shown above, as well as one in Kumano, shown below. Let us study the meaning of isa in the names Isako, Isanami, and Isanaki. Isanami, the daughter of Toyoke-sama, had the childhood name of Isako. After she married and the couple became the head of the land, she was named Isanami and he became Isanaki. Here, i has the greater meanings of mind, spirit, faith, and will. The ideogram sa (drawn as a circle with a horizontal line through it) in isa means rich and clear, pure and bright. Notice how the bar of the s glyph takes the a energy and spreads it evenly when forming sa. Thus, one of the meanings of isa is bright spirit. In Isanami’s name, on the left of the figure, we note the ideogram for mi. The symbol for the consonant m shows a horiontal line indicating the balancing of energy and then the horizontal line sending the energy down. Mi means fruit, body, self, very appropriate for the female. For Isanaki, the last ideogram is that of ki which, in addition to meaning tree, also means male. Isanaki is an abbreviation of Isana-kine. Kine is the honorific title for man. It has a good connotation. Isanaki’s name is sometimes written as Isanagi, which is another abbreviation for Isana-kine. Although in general voiced consonants such as g and z are considered to have a negative meaning, in this case gi is not negative and is permitted in Wosite. We note that in later documents, however, the names Izanami and Izanagi have replaced the s by the voiced consonant z . These are serious errors which darken and lower the energies. Remember that the horizontal lines in sa and in mi mean that energy is being balanced and harmonized. Balance and harmony play important roles in the worldview of Wosite. Therefore, we do not recommend using these spellings and pronunciations of these two beautiful names. It is said that this natural stone monument marks Isanami’s resting place at Hana-no Iwaya, a sacred place in south Honshu in Wakayama. This figure is that of imo. Imo means sister, wife, sweetheart (and also the potato). Amazingly, this word imo appears 58 times among all the Wosite documents. In this part of Hotuma Tutae, we are reading about Ukesuteme and Kokori-hime who were studying with Toyoke-sama. Kokori-hime was the sister of Isanaki. Toyoke-sama, father of Isanami who married Isanaki, connected them as step-sisters. Toyoke-sama is known for a long history of philosophy, analysis, and technology. He was unparalleled as leader, educator, and statesman. This entry was posted in Vowels and tagged Imo, Isanami, Kase on 2016-01-02 by Okunomichi.